If your little one has a birthday coming up but wants a party with a difference then this could fit the bill. I can come to the venue of your choice, but please note travel costs may be incurred. Sarah Swirled belly dance can provide a party for your little one to meet her needs. party content may vary according to the ages of the children attending, and what the birthday girl want to include but as an example: Sarah can come and teach the children a simple choreography using either a prop (veil, or finger cymbals) or without, using basic belly dance moves appropriate to the children's ages. I can include one or two party games if time permits, but only upon prior agreement. Included in the price are: party invitations, a bindis for each party guest to wear, the use of a coin hip belt for the duration of the dancing, the use of a prop (if using) for the duration of the dancing. prizes for any games played. Extras include: party bags, a coin hip belt for the birthday girl to keep, a prop for the party girl to keep, a birthday cake. Parties cost from £75 per hour and for up to 15 guests. I can cater for more, but at extra cost of £2 per extra child. Boys are most welcome to attend, but I ask that you let me know of numbers upon booking so I can cater for them. Should you wish a birthday cake, please discuss this with me first. The cost of the cake will vary depending on the ingredients used and the decoration used, but this will be agreed prior to booking,. Why should the children get all the fun? Sarah Swirled can provide an adult party too. Please note: Sarah does not provide a male only party service. If you have a special occasion coming up and want something different then Sarah Swirled can cater for you. Sarah can come along and teach you and your guests a simple choreography with props (choose from veil, stick or finger cymbals), or not. I can use a piece of music of your choice (please give me chance to choreograph this) or I can use some of my own music. If you wish, Sarah can provide a demonstration for you too, to be discussed. Parties cost from £100 per hour and a half. I can come to the venue of your choice but please note, travel costs may be incurred. For more information please visit my website. Sarah Swirled Belly Dance has designed a beautiful birthday cake specially for children. The cake can be made from either sponge (flavours include plain, chocolate or lemon) or fruit. This is then decorated in the colours of your choice (if available). I try and use as much edible decoration as possible, but there are times when I have to resort to non-edible. For example, the clothes that I make for the oll were made out of felt and therefore are not edible. Likewise, some of the beading on the skirt were inedible also. Please note: any inedible decoration will be removed before the cake is cut into. The figurine is NOT a doll, but a cake-makers accessory but you may keep her should you wish. The price of the cake will vary depending on the ingredients used and the decoration, but you will receive a full breakdown of the cost upon request. Please contact me for more details. Belly Dance: Styles and Costuming. Suitable for everybody, adults and children, this talk is not only informative but entertaining. Sarah takes you on a journey of Egypt and the surrounding areas, describing different dance styles as we travel. Not only that, but you will get to see examples of each dance style as well as passing around the many different costumes which accompany each dance style so you can feel the weight and see the way they are sewn. By the end of the evening, you will (hopefully) begin to understand that there is much more to what we know as 'belly dance'. The talk normally lasts for one hour although times can be varied accordingly (please note that talks shorter than one hour will still be charged at the hourly rate). A one hour talk costs £50 but travel costs may be incurred. A full breakdown of expenses will be provided and I am open to negotiation. 1) An Introduction to Belly Dance. 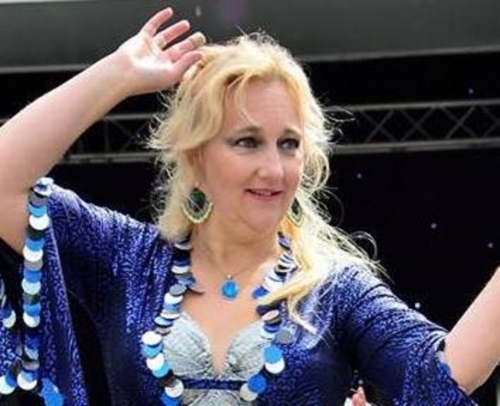 - In this workshop I will teach you some of the basic moves used within Egyptian belly dance. Once we are comfortable with these moves, I will then move on to teach a simple choreography to a fun pop piece using the moves we have learned. 2) An Introduction to Saidi Stick Dance. - This workshop concentrates on the Saidi style of belly dance. The dance is linked with a form of martial art which was used in Ancient Egypt, and as such this dance is linked with men. I will show you how to manipulate the stick as well as teach you some special stick moves that can be used in the dance before moving on to a simple choreography. 3) An Introduction to Veil Dance - The veil is a beautiful prop with which to dance but it isn't always as easy as it looks. I will teach you how to hold the veil as well as manipulate it. We will also learn some lovely veil dance moves before moving on to a simple choreography using our veils. It is recommended that you allow at least an hour and a half for a workshop to get the most out of it, although I can shorten or lengthen them accordingly. All moves used are appropriate for children as well as adults and all workshops can be altered according to experience. For further information contact me directly or visit my website. These classes are for students with at least one years experience of regular belly dance classes. They are not really suitable for beginners. The Crash Course has been designed for you. Students should already have the basic moves of belly dance. These lessons will further develop the skills they already have. Looking at more difficult moves, different dance styles, musicality, performance, choreography and much more. We also work towards exciting projects and there are ample opportunities to show off your new skills by performing for those so inclined. For more information contact me directly. Cost: £5.50 per 90 minute class. £5 per 60 minute. What to wear: comfortable clothing that allows you to move freely, i.e. leggings, gym wear, T-shirt, skirt, etc. I tend to dance bare foot, but you could always wear soft soled flexible shoes. Please bring a drink of water or cordial with you. No alcohol and no coffee. Suitable to use for any occasion and available for difference cash amounts. Use towards dance classes, services or goods available from Sarah Swirled. Gift vouchers are available in several denominations, with the name of the giver and the recipient. They also come in their own envelope and tied with a bow. Available to buy from my website. And all this for just £60!!! So why not give the gift of dance to that special someone? Organizing an event is always stressful, but add a Hen and it can be even more difficult. Why not take the strain off and let somebody else run the event for you. Dress up in the home-made costumes provided before enjoying a photo shoot with your friends. If there are any special groupings you would like let me know. All photos are edited and emailed to the organizer after the event. Then, learn some dance moves and a group choreography to your favourite song. Or why not use a Middle Eastern song instead? The choice is yours. You get a free bottle of Prosecco and there's even a gift for the Hen. I am really excited to be able to offer weekly dance classes for beginners, starting on Monday 11th March. These classes are suitable for anyone new to belly dance (i.e. no previous experience required). Students will begin by learning the basic technique of belly dance, but as they progress new things will be introduced, such as choreography, different dance styles, and much more. Students can choose to Pay-as-you-go at £5 per lesson, or (for a limited time only), if you buy 5 lessons in advance you'll get the 6th one free! Booking for the Pay-as-you-go option is not required although it would be helpful to add you to the list. Bookings for the special offer (buy 5 get the 6th free) are now being taken via my website. This must be done in advance. Originally created to encourage new students, the Beginners Belly Dance Crash Course proved to be very popular, but the downside with it is that once it was over, it was over. Another downside to it was that it was based in one venue, and not everyone can travel. And so I have created the out-of-house Crash Course. The Beginners Crash Course is made up of six hours of learning, where students will learn some of the basic technique of belly dance. But, the advantage of the Out-of-House Course is that I can travel to you! YOU can decide how you want the course to be taught, i.e. one hour a week for six weeks, two hours a day for three days, or perhaps weekend is better. The choice is yours, and you can also choose the venue. If this sounds like something you might be interested in, why not contact me today to find out more? It's great fun, brings people together, and it's a way of getting fit too.